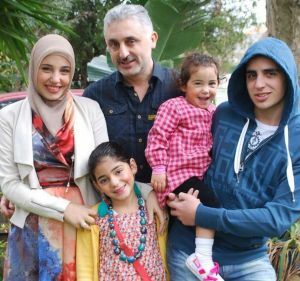 Ahmed Abou-eid was enjoying a beautiful day with family at Harmony Park in Coburg on Wednesday when things turned ugly. “My wife and friends frequent that park often, and the kids have a great time. It’s called Harmony Park for a reason – there’s so much friendliness in the park,” the Thornbury man said. Caution: strong language. An intoxicated man hurls racial abuse at a family enjoying a picnic at a park in Melbourne’s north. A man clutching a whisky bottle, hurling offensive language and racial abuse, quickly changed the mood from playful to frightening. 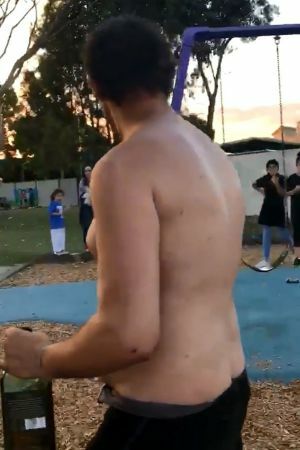 The man who racially abused several adults and children at a popular Coburg park on Wednesday. Photo: Ahmed Abou-eid. “This man was sitting on his own, on a table, and there was a couple not far from him sitting on a table next to him, and he started hurling abuse at them, and telling them to get out of the country,” Mr Abou-eid said. Mr Abou-eid said said the man was clearly intoxicated, slurring his words and wobbling as he approached and started hurling abuse at anyone within earshot. The man walked back to the table, and then came back for a second round. Mr Abou-eid said that was when he decided to film him. “I thought this is too close for comfort, I better film this,” he said. “Nothing, go back to where you’re sitting,” Mr Abou-eid responds. “Have you thought about my family? No you don’t even think about it,” the man says, in between expletives, repeating the words “wog” and “dago”. The man walks closer to Mr Abou-eid, realising he is being filmed, and says “you’re not allowed to take my picture”. He walks around the playground, next to where the children are playing. “Oh you’re a macho man,” he says, inciting a fight. He then turns on one of the women, “Go back to Greece you f—ing wog,” he yells. The man eventually throws a punch at Mr Abou-eid, but Mr Abou-eid does not retaliate. “Just go back, just go back,” he says to the man. At the end of the video the man sits down inside the playground, crosses his legs, and clutches his bottle of whisky. Mr Abou-eid said after he stopped filming, several people around him decided to leave the park. “Some families got their kids and got in their cars and drove off, and then about six or seven guys surrounded him and I think he got scared so he stopped abusing everybody,” he said. Police were called several times during the altercation. Once they arrived the man was taken away, but Mr Abou-eid said he did not want to press charges as he didn’t want to relive what had happened. “The police told me, they’ve had a few problems with him in the area, but not in the park, and not actually abusing anyone to the extent that he had that day,” he said. “You think it’s the drink or the alcohol, but these people have this racism in them that comes out of them the more they drink. He said, by filming the incident, he hoped he could make people aware of the abuse, and urged people not to stay silent. “These things are happening, they are real and people must stand up against these things. If they see something like that happen, don’t walk away, help out if someone needs help, step in,” Mr Abou-eid said. Mr Abou-eid said he worried about how witnessing such abuse could affect his children in the future. “My six-year-old asked me today if the man was still in jail. They’re still thinking about it, and they’re scared to go back to the park again,” he said. Moreland City Council mayor Helen Davidson said the behaviour was unacceptable. “Moreland takes great pride in having such a culturally diverse community. This behaviour goes against what the community of Moreland stands for,” she said. Advice from the Australian Human Rights Commission about being a bystander to racial abuse is “if you see something, say something, if it feels safe to do so”. Fairfax Media has chosen to blur the face of the man yelling abuse due to his level of intoxication. This entry was tagged Ahmed Abou-eid, Australian Human Rights Commission, Canberra Times, Coburg, Emily Woods, Harmony Park, Mayor Helen Davidson, Moreland City Council, racism, racist, racist rant, The Age. Bookmark the permalink.